Make sure you don't miss this very unique 4-day Ayurvedic cooking workshop coming up next month! DATES: April 11 to 14. 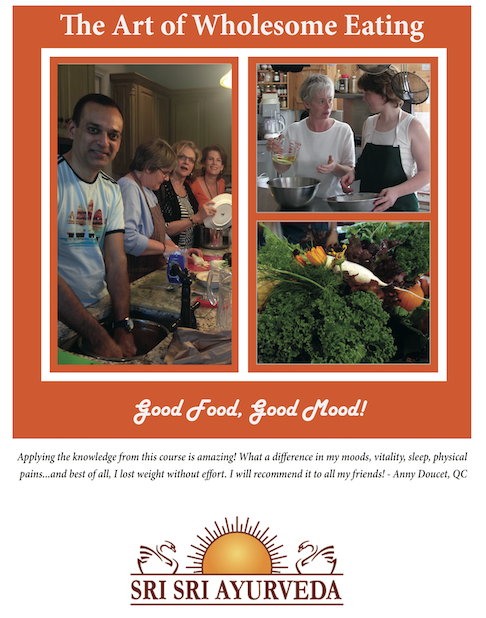 The Art of Wholesome Eating is an empowering course bursting with knowledge from the lively ayurvedic tradition! It offers specific tools for your own constitution and kindles the fun of effortlessly cooking with energizing nutritious ingredients from around the globe. This program of six lessons is designed to help those who are interested in changing to a vegetarian diet incorporating an approach from the Ayurvedic system of health care. The course will address many issues of diet, teaching how to recognize our own imbalances and to be able to help correct through appropriate food. There are many questions asked by people new to this approach to health including: where will I find my protein? What about vitamin content? Will I have enough energy? Ayurveda recognizes that each of us is unique with different needs. Changes of life style or habits should be taken gently without stress to ensure longterm comfort. Each lesson will be 2 1/2 to 3 hours long and is structured to introduce the basic concepts of Ayurveda by a systematic approach throughout the course. Linking into these principles there will be a practical demonstration on different food topics, using cooked and raw foods. Subject : What is Ayurveda? Subject : The Gunas and food. How does food affects the mind?